← Part II – Rigged Elections for Romney? (Washington, DC) Our elections are officially privatized. They are hidden from our view by design. This is the most profound election fraud imaginable. It affects every citizen, all 311 million of us. Privatization occurred without our knowledge or consent. Was our vote cast and counted properly? We have no way of knowing. Can we observe vote tallying at precincts and central tabulation locations? Not likely. If you could, what good would it do to watch an encased computer running indecipherable software? This violates prohibitions against secret vote counting in many state constitutions. Our elected officials could not care less. But wholesale election fraud began long before voting and tallying machines entered the picture. That will be discussed at the end of the article. As we approach November 6, it is important to understand two major sources of current election fraud. A hard working team of volunteer researchers and analysts gathered raw data, precinct votes, for the 2012 Republican primaries. Rigorous statistical analysis showed a specific pattern of suspected vote flipping that lead to highly improbable victories for Romney. This was termed the amazing anomaly by the research team. Urban Density was factored out of the analysis, yet the anomaly remained. All precinct-level demographics available were tested to see if they could cause such an anomaly to no avail. Again, this amazing anomaly remained in the results. Vote flipping involves exchanging votes from one candidate to another or several others. It is a clever way to benefit a candidate, victimize his or her opponents, while at the same time keeping the precinct vote totals the same. The researchers discovered that often, election officials count and compare only precinct totals with the Central Tabulator count. This simple, yet highly effective fraud strategy could have been undetected for years. In state after state, allegedly because of vote flipping, Romney showed unexplainable increases from the smallest to largest precincts. The process was outlined recently in two articles: Rigged Elections for Romney? 10/22/12 and Part II – Rigged elections for Romney? 11/1/12. The following eight states represent 102 electoral votes. They all have two things in common. They are tossup/battleground states and they all showed clear signs vote flipping during the Republican primaries, always in Romney’s favor. Romney won six of the states (seven if you include his Iowa win, which was reversed). These states will deploy in the Nov.6 general election the same voting machines, central tabulators, and election officials and their partners, staff from the private voting machine companies. Graph from Francois et al. research team. The graphs and impact of suspected vote flipping in Wisconsin’s 2012 primary are even more dramatic as shown here. Romney would have lost Wisconsin, as well, were it not for the unexpected, highly improbable phenomenon reflecting suspected vote flipping. Certainly, after losing these two key states, a brokered convention would have ensued. Romney’s vote total always expanded due to the suspected vote flipping pattern. The other candidates lost votes in almost every case. The research team shared its methods and findings with over 150 academics with specialties in election integrity, elections officials, and the general public. The first two groups provided encouraging responses, but were unable or too busy to evaluate the compelling evidence of election fraud or to consider the implications. There have been over 100 inquiries by motivated members of the pubic, however. So the project continues. It is clear that the people have to protect their own elections. Rich Charnin has been studying and writing about election for early ten years. He was one of the first researchers to discover the inconsistencies in the media consortium’s exit polling and the first researcher to look beneath the surface of the 2004 election. Charnin predicted the exact electoral count of the 2008 election and updates his blog daily. His latest book, Matrix of Deceit: Forcing Pre-Election and Exit Polls to Match Fraudulent Vote Counts, shows how the media consortium uses their exit polls to ratify questionable elections. The official exit polls released by the networks and major news outlets are adjusted before release to match the official election results. Charnin was the first to point out that that nearly half the official media consortium’s state presidential exit polls exceeded the margin of error in favor of Republicans and only three did so in favor of the Democratic presidential candidate. The probability of that happening is one of those unfathomable improbabilities, one in several trillion. Where are the experts, academics, and elections officials who prop-up an indefensible election process? What do they have to say in their defense? Nothing. Black citizens in the former Confederate states were the first targets of wholesale election fraud. During the Reconstruction Era following the Civil War, black citizens were able to vote. The Union Army troops stationed in the former Confederate states protected that right. Black participation in elections was as high as 80% in some areas. When Reconstruction ended as a result of the Compromise of 1877, Southern blacks lost everything, including their right to vote. This lasted for nearly a century until the passage of the Voting Rights Act of 1965. Between 1890 and 1960, each presidential election had at least five million fewer votes due to the loss of voting rights by black citizens in the South. 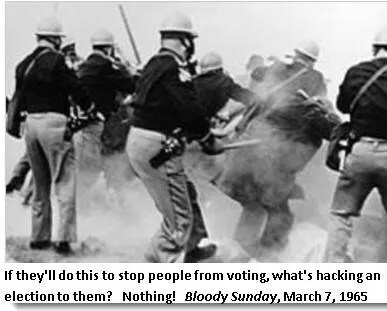 Imagine the change in elections without this theft of voting rights? Stealing the vote from minorities was deliberate post-Reconstruction strategy developed by none other than the Ku Klux Klan and the Redeemers movement. Programs like photograph identification found in key states are a descendant from the original efforts to disenfranchise Southern blacks. Laws that strip the vote from ex-felons also trace back to these racist efforts. Nearly six million former felons are denied the right to vote. Why is it so important to lock people out of the voting booth? Why is it so important to keep private company voting systems that consistently produce odd and unexplainable results? Power and control are the central motivations. If your political program is to keep the majority down, you favor election fraud as an exquisite tool. Treat the people like chumps by creating a façade of democracy and belittle anyone who questions the system by calling them conspiracy theorists. Most importantly, never, ever admit that there might be something very wrong. The manipulation of “official” exit polls or the complete cancellation of such polls in 19 states this year, teamed up with suspected vote flipping (in the most blatant way imaginable) represent an improvement of sorts. Instead of targeting the minorities and poor, these programs are truly egalitarian. They target everyone. Part II – Rigged elections for Romney? 11/1/12.